Yes sirree folks, we’ll be here all week, so please step up and see the show! We breezed into town, with the same rainstorm on our heels that has followed us all the way home, from the Tetons. For the last three days, we’ve driven through the front and got ahead of it, only to quit for the night and give it plenty of time to get ahead of us again. We picked up today’s rain, at the halfway mark, Columbia and pushed through it to arrive to a relatively dry Saint Louis. Well, at least it wasn’t raining here when we arrived and there was enough dry to get the car unpacked. Looking at the radar after our arrival, it looked like the thunder-boomers had coalesced all along I-70, blocking off any thought of going back. The house was fine, thank you Joanie. Man, it feels good to be home! We’ve been gone 29 days. We’ve driven over 5,000 miles. We’ve visited five national parks, plus two national monuments. We tent camped 75% of the time. Up from last year’s similar trip, where we only camped about half the time. We saw lots of wildlife, did lots of things and generally had a really great time. We pretty much followed our original itinerary. We worked the plan and had fun. 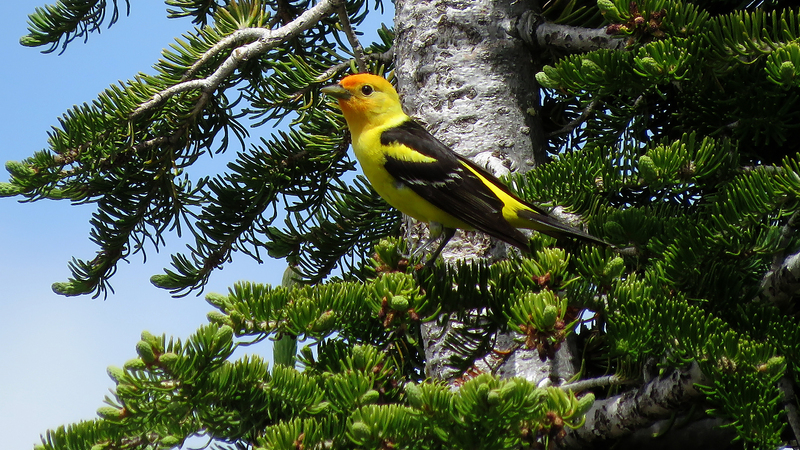 When we were last in Yellowstone, we saw this Western Tanager in the valley of the Lewis River. This is where the Lewis and Clark expedition first saw this bird. It’s good to see that this bird is still doing so well after 200 years. This entry was posted in Birds, Nature, Photography, Saint Louis by RegenAxe. Bookmark the permalink.